Methodologies and legislative frameworks regarding the archaeological excavation, retrieval, analysis, curation and potential reburial of human skeletal remains differ throughout the world. As work forces have become increasingly mobile and international research collaborations are steadily increasing, the need for a more comprehensive understanding of different national research traditions, methodologies and legislative structures within the academic and commercial sector of physical anthropology has arisen. The Routledge Handbook of Archaeological Human Remains and Legislation provides comprehensive information on the excavation of archaeological human remains and the law through 62 individual country contributions from Europe, Asia, Africa, North America, South America and Australasia. What is the current situation (including a brief history) of physical anthropology in the country? What happens on discovering human remains (who is notified, etc.)? What is the current legislation regarding the excavation of archaeological human skeletal remains? Is a license needed to excavate human remains? Is there any specific legislation regarding excavation in churchyards? Any specific legislation regarding war graves? Are physical anthropologists involved in the excavation process? Where is the cut-off point between forensic and archaeological human remains (e.g. 100 years, 50 years, 25 years…)? Can human remains be transported abroad for research purposes? What methods of anthropological analysis are mostly used in the country? Are there any methods created in that country which are population-specific? Are there particular ethical issues that need to be considered when excavating human remains, such as religious groups or tribal groups? In addition, an overview of landmark anthropological studies and important collections are provided where appropriate. The entries are contained by an introductory chapter by the editors which establish the objectives and structure of the book, setting it within a wider archaeological framework, and a conclusion which explores the current European and world-wide trends and perspectives in the study of archaeological human remains. 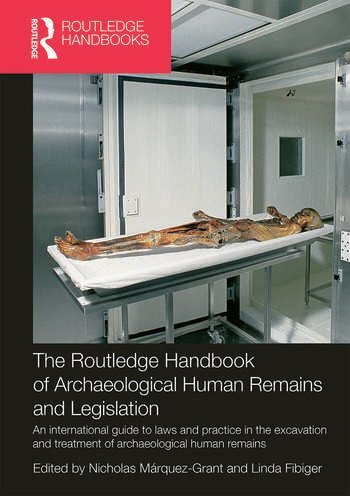 The Routledge Handbook of Archaeological Human Remains and Legislation makes a timely, much-needed contribution to the field of physical anthropology and is unique as it combines information on the excavation of human remains and the legislation that guides it, alongside information on the current state of physical anthropology across several continents. It is an indispensible tool for archaeologists involved in the excavation of human remains around the world.